These numbers reflect estimated student expenses for the 2019-2020 school year. Amounts will change slightly from year to year, but as the cost of college increases, the scholarship packages will correspondingly increase. Your official financial aid award will be included in a letter directly from Vanderbilt. Outside funding is taken into account as part of a student's total need-based aid package and cannot be counted as part of the family contribution. If an adjustment to a need-based financial aid package is necessary, the outside funding will be used first to replace a student's earnings expectation/Federal Work-Study before reducing Vanderbilt need-based assistance. Vanderbilt requires all students to have health insurance, either through a parent or another plan. The annual cost of the Vanderbilt Student Health Insurance Plan will be included in the fall semester charges unless the student submits evidence of adequate coverage under another policy. An allowance for health insurance is included in the Personal category of the Cost of Attendance. Deadline to waive Vanderbilt Health Insurance plan is August 1 each year. A travel allowance will be determined by Vanderbilt based on the student’s home residence and included in the Cost of Attendance. Students must be making Satisfactory Academic Progress and submit a complete financial aid application each year as outlined on the Financial Aid website in order to maintain the match scholarship award. The Financial Aid Officer will then review the yearly information and create an award based on the updated student cost of attendance and student circumstances. Vanderbilt guarantees a zero parent contribution and zero loans each year. Financial aid awards are provided for a total of 8 semesters of undergraduate study. Vanderbilt is firmly committed to meeting the full demonstrated need of every qualified student with an aid package that does not require a loan. The average aid award at Vanderbilt is made up of 97% grant/scholarship assistance and 3% work expectation. Students who come from economically disadvantaged backgrounds (where the family income is under $50,000 and the family has minimal assets) typically have no parental contribution expected. Parents may be asked to contribute small amounts when the family income is between $50,000 and $75,000. 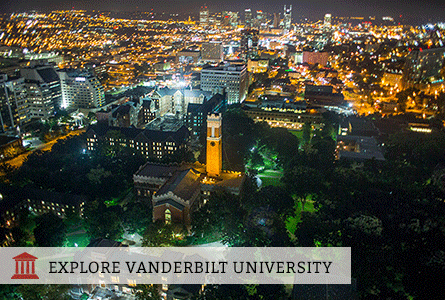 The Vanderbilt award for students who we have determined to be economically disadvantaged is shown above. Even if your family does not fall into this category, keep in mind that Vanderbilt provides generous no-loans packages to students from a broad range of financial circumstances. Over 60% of Vanderbilt undergraduates receive financial assistance from one or more sources. Additional information regarding Vanderbilt’s financial aid program can be found on their website. Use the Net Price Calculator to determine the financial aid for which you are eligible.